Roehampton Festival of Computing is being held on June 17th 2016 and I was more than happy to take part when asked by Yasemin Allsop, even with a flight of four hours from Moscow involved! I am looking forward to meeting quite a few people again such as; Yasemin Allsop, Miles Berry, Steve Bunce and Kate Hudson from Roamer As you can see from our project page I have been working with Roamer to see how EAL students can develop their English language, so it will be great to catch up with each other. There are a few others with whom I am keen to meet for the first time; Julia Skinner who is responsible for the 100 word challenge I tried this with my students when I first arrived into Moscow, they were quite challenged by the task. My workshop will cover the use of Skype and how it can be used to develop children’s scientific argumentation skills. Whilst whole class teaching using Skype can have its uses, I believe using it for small group work will have better outcomes for some children. I have been using it here in Moscow with children whose first language is not English. There are of course some classroom management issues but these are not difficult to overcome. Used alongside resources such as concept cartoons to stimulate debate there is huge potential to improve children’s discussion skills. 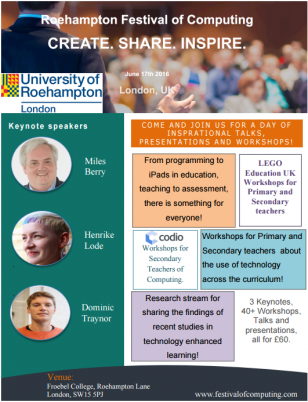 More details about the potential of Skype will be discussed on Friday 17th June at Roehampton Festival of Computing. I hope those who attend will find the topic useful.